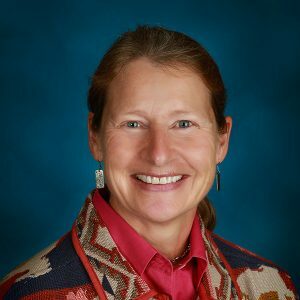 Jill Pitcher, DO, FACOFP, Associate Professor of Family Medicine at Rocky Vista University (RVU), was named the 2019 Outstanding Female Leader of the Year by the American College of Osteopathic Family Physicians (ACOFP). She was presented the award on Thursday, March 21st at the Opening Session of the 56th Annual Convention and Scientific Seminars in Chicago, Illinois. A certified physician in osteopathic family medicine, correctional medicine, and holistic medicine, Dr. Pitcher has over thirty years of broad clinical experience that includes wide spectrum family medicine, urgent care, and chronic pain management. She is a Founding Diplomat of the American Board of Holistic Medicine, and has served as a lead physician treating fibromyalgia and chronic fatigue and as a correctional facility medical director. In addition to continuing practice experience precepting family medicine residents, Dr. Pitcher has merged her love of medicine and teaching as a faculty member in RVU’s Department of Primary Care Medicine. For the past eight years, she has dedicated herself to teaching the next generation of osteopathic physicians. She believes in providing compassionate care to people from all walks of life, and that, with an excellent education, students will be able to do the same for their future patients. The Outstanding Female Leader of the Year Award honors female physicians who serve as clinical role models, teachers, professional leaders and sources of inspiration for women and men who are in medical training. It is administered to qualifying physicians through the Women’s Health & Leadership Committee, which seeks to develop education and networking opportunities that promote women in leadership roles in the osteopathic profession. To qualify for the award, nominees must be in active practice for at least five years as well as be a current member of the ACOFP.